RAJSHAHI: With establishing boutique houses, many underpri-vileged and distressed women have become income-generators in the metropolis and its outskirts contributing a lot to the society in many ways, reports BSS. With training and financial support from the government they established embroidery and boutique houses and running their business successfully. “We have founded ‘Angona Boutique and Fashion’. The business house is being operated by our Angona Mohila Samity successfully making more than 100 women self-reliant,” said Iffat Ara, director of the samity. Similarly, Daudpur Mohila Koliyan Samity is running Shefali Boutique and Mohona Mohila Kolyan Samity’s Mohona Boutiques making at least 175 women self-reliant. “We have made linked around 50 women with skill development training for improving their living condition,” said Anwara Begum, President of Dashmari Distressed Women Welfare Association. 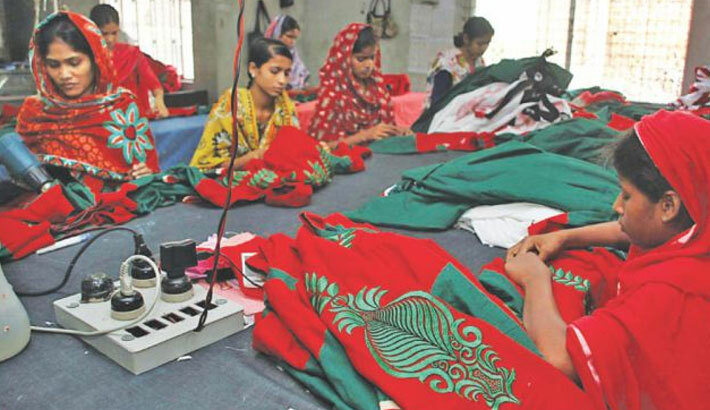 After completing their training they are doing block, boutique and embroidery works in their respective areas and many of them attained their long-cherished economic emancipation. Anwara Begum told the agency that the boutique houses were established and operated with assistance of district women affairs office. The office is implementing a project titled “Women Skill-based Training for Livelihood” in order to make the underprivileged and neglected women especially divorcee, widow and financially backward self-reliant. Under the project, the targeted women are given three-month training on various trades like sewing, block-boutique, embroidery, beautification, food processing and mobile phone servicing. They were also given financial and some other requisite supports after training. “Raziya Sultana, 25, of Dharampur Bazekazla earns around Tk 400-500 per day by making and selling cloth bags for shopping, said a local community leader. Rahima, 30, wife of Rustam Ali of Hetemkha area, told BSS that she received the training on tailoring. Now, she has brought some happiness in her four-member family as she earns Tk 500-600 per day after operating a sewing machine at present. District Women Affairs Officer Shahnaj Begum told that the project intends to involve the socially backward women to the country’s overall development process and the beneficiary women are becoming self-reliant and part of the development. Sharing views on the issue Kolpona Roy, local unit president of Bangladesh Mohila Parishad, said supporting skills development to the poor women in the society for better economic condition is very important.